Cormorants like this one are the star of the show during fishing on the Nagara River in Gifu Prefecture. Most fishermen rely on their prey having the misfortune to bite on their hooks or become trapped in their nets, but some of Japan’s fishermen take a more aggressive approach – they send in cormorants to chase after the fish. People living by the Nagara River in Gifu Prefecture have been fishing with these fast and agile birds for over 1,300 years, and visitors now come from all over the country to witness what is one of the most ancient arts in all of Japan. Fishing with cormorants is considered such an important activity that the emperor has sponsored the Nagara River’s fishing masters since 1890, to ensure that the practice continues. They have the official title of ‘Imperial Fishermen of the Royal Household’ – a hereditary title that is passed from father to son. Cormorant fishing is practiced in thirteen locations across Japan, from the islands of Kyushu and Shikoku to the Fuefuki River in Yamanashi Prefecture, just 100km west of Tokyo, but it is only the Nagara River’s fishermen who enjoy royal patronage. Even the river itself receives special protection to ensure that it stays clean and healthy. Three of the Nagara River’s fishing masters are based in Seki City, but it is the six who are based 20km downstream in Gifu City, the prefectural capital, that most sightseers go to watch. 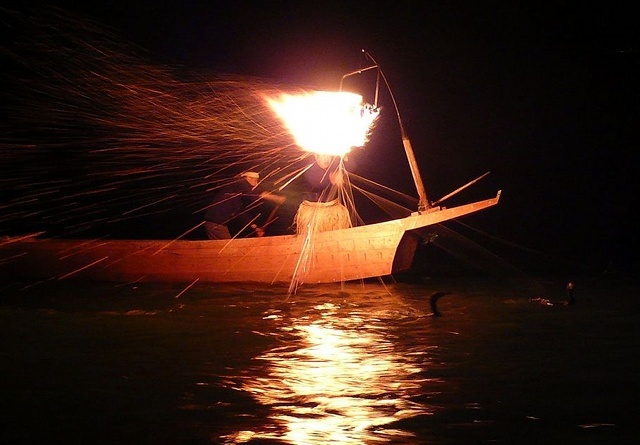 Cormorant fishing doesn’t begin until after dark, and so each boat carries a small pinewood fire that is held in a basket, and hangs from a pole that projects over the front of the boat. These fires not only light the way, they also attract fish. The first thing that spectators get to see is a fire slowly emerging from the darkness, and then a faint image of the lead boat surrounded by flickering orange reflections. As the boats get closer, you gradually become able to make out the fishing master and his assistant (who’s often his son) and the pilot who steers from the back of the boat. Two cormorants can be seen on the surface, but the tethers leading into the water show where others have dived in search of fish. The fishing master, wearing a straw skirt, is keeping a close eye on his birds, while his assistant helps to steer the boat. The master leans out over the water, holding the reins of ten to twelve cormorants in one hand, and using his other hand to stop the tethers from tangling. The cormorants swim ahead of the boat and dive down seeking fish. Sometimes they surface with a bulge in their throats showing they’ve been successful, other times they come up with nothing. If they’ve got a fish, they’re brought back to the boat, where the master gets them to cough up their catch, and they are then released into the water again. Gifu’s fishing boats sail down the river one after the other (the fishing masters draw lots each night to see who gets to go first), then at the end of the night they line up side by side to chase any remaining fish into the shallows. This creates a spectacular finale, after which you might get a chance to see the catch before the fishermen head home. Film star Charlie Chaplin was so impressed by cormorant fishing that he twice came to the Nagara River to see it, calling it ‘the finest art Japan has to offer’. Spectators have two options: either take a ride on a sightseeing boat, or just watch from the promenade beside the river. The spectator boats take up positions along the riverbanks, and then wait for the fishing boats to come past. As the river isn’t very wide, and the fishing is conducted in quite a short stretch, you might actually get a better view by watching from the banks, but most people choose to go on a boat anyway. Fishing takes place in the evening, from around 8:30pm to 9:30pm, but the first boats leave at 6:45pm so that their passengers have a chance to eat dinner, and possibly drink a bit too. You have the option of taking your own food and drink, ordering a boxed meal when you book, or buying from a vending boat. The vending boat also sells fireworks, which you can set off before the fishing begins. Before passengers board the boats, a fishing master gives a demonstration of his skills using one of his cormorants. The masters wear a dark tunic, a hat and a straw skirt, the same as they have for hundreds of years. Apparently it’s well suited to their occupation, but the straw skirts don’t half look weird. To keep the spectators entertained until the fishing begins, a dancing boat travels up and down the river, carrying women dressed in kimono who perform traditional dances. When the time comes, three fireworks are set off to signal that the day’s fishing is beginning. Gifu Prefecture isn’t the only place where you can see cormorant fishing. 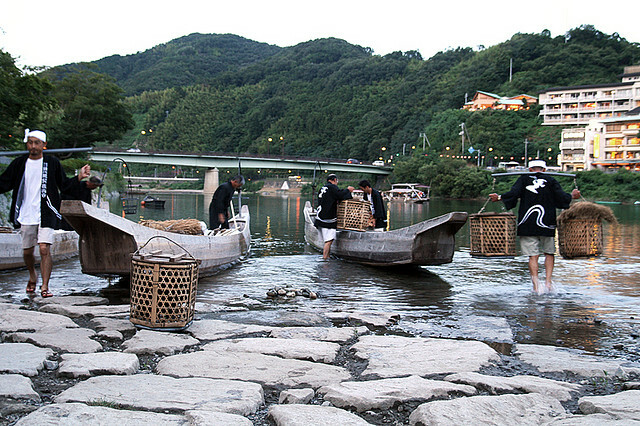 These men are loading cormorants in baskets onto boats in Iwakuni City in Yamaguchi Prefecture. The cormorants are transported in baskets, but when they’re let out, the fishermen keep hold of them using a tether attached to a cord round their necks. This cord isn’t just to keep hold of the bird – it also stops them swallowing any of the bigger fish. It’s just loose enough so that they can swallow small ones, and fortunately for the fishermen, they don’t seem to be clever enough to work out that they’re the only ones it’s worth their while catching. The cormorants, which are about 80 to 90cm tall, have pouches (called ‘crops’) at the base of their throats, which they normally use to hold fish that they’re not yet ready to digest. It is here that any big fish they catch end up, so all a fishing master has to do is pull them back to the boat using their tether, then force the fish out by putting his hand around the birds throat and easing it upwards. This means that the fish never enter the birds’ stomachs, so remaining relatively unscathed and fit for human consumption. The main target species is ayu, which is also known as sweetfish because of its taste. It’s said to have ‘melon and cucumber aromas’, and is considered to be something of a delicacy. The birds’ beaks do tend to leave marks on the fish, but these are seen as an indication of how the birds were caught, and are thus valued as a sign of quality. The imperial household certainly don’t seem to be averse to eating food that’s already been swallowed and then spat out again – part of the first catch of each season is sent directly to the Imperial Palace in Tokyo. While the birds might seem to get a raw deal out of this kind of fishing (they don’t get to eat most of the fish), the fishing masters talk of a close partnership between themselves and the birds. They keep their birds in aviaries attached to their houses, and each day they talk to their cormorants and stroke their heads and bellies to gain their trust, and to show their love and affection. This woodblock print by Keisai Eisen depicts cormorant fishing in Gifu City (then the Godo-juku post station) during the 1830s. 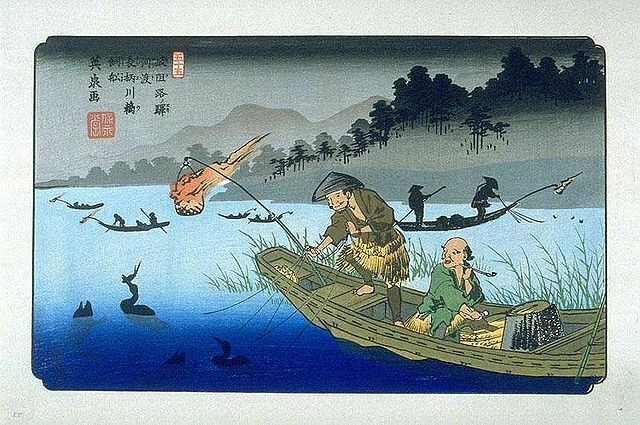 You can see how little Nagara River cormorant fishing has changed since that time. The birds used on the Nagara River are Japanese cormorants, whose natural environment is the sea. They’re captured from the wild, and initially it takes them a while just to get used to the fresh water of the river, and to learn to catch fish there, so at first they’re fed by hand. 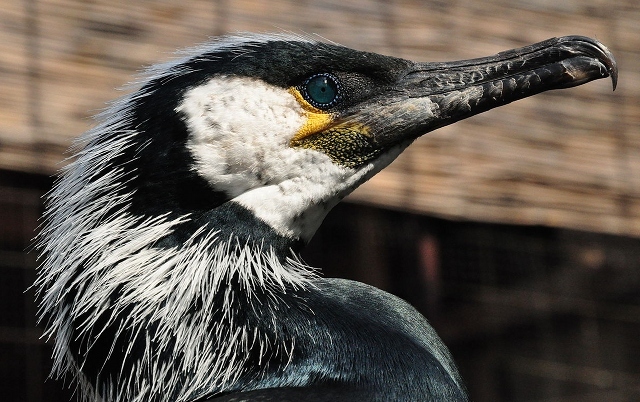 Japanese cormorants typically live for about 15 years (the record is 26), but it takes about three years to train them. Fishing masters have spoken of their admiration for the birds, their agility and grace, and the beauty of their cobalt-blue eyes and hooked beaks. They insist that cormorant fishing is only made possible by nurturing the birds as part of the family. Exactly whereabouts the fishing takes place varies each night, but the spectator boats always depart from the Viewing Boat Office, located on the south side of the river, near the western base of Nagara Bridge. To get there take a bus bound for Nagara from bus platform 1 at Gifu Station, or bus platform 4 at Meitetsu Gifu Station. Buses run about every five to ten minutes, and cost ¥200. You should get off after about 15 minutes, at the Nagara-bashi stop. Gifu City is about 30km northwest of Nagoya, and can be reached from Nagoya Station via the Tokaido Line in 26 minutes (¥450). Nagoya Station is on the Tokaido Shinkansen Line that connects Tokyo and Osaka. You can book your place on a sightseeing boat by calling 058-262-0104, or you can book online (and check availability) here. Cormorant fishing takes place every day from May 11 to October 15, except during the full moon. It’s also cancelled if the river level is too high, the water is too muddy, or during heavy rain, so be sure to phone up and check it’s on before you go. Be aware that cormorant fishing draws a lot of visitors, so your boat will be one of many that set out each night. More details are available on the official website, but only in Japanese. On the opposite bank of the river to the Viewing Boat Office, is a small row of houses where the fishing masters have lived for generations, known as ‘Ukai no Sato’ (Cormorant Fishing Village). As they’re private houses, you can’t go in, but you can usually see cormorant cages and piles of firewood stacked in the front yards, as well as other tools of the trade. If you’re lucky, you might meet some of the fishing masters, who are often willing to demonstrate aspects of their art. 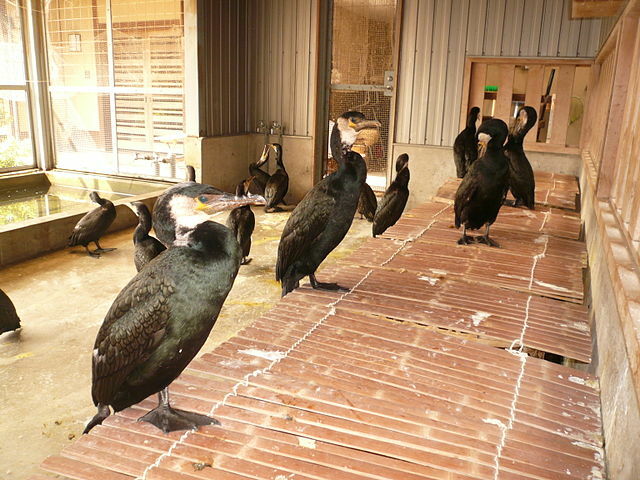 These cormorants are in the aviary attached to the house of one of Gifu City’s fishing masters. Each day the masters select ten to twelve of their birds to take fishing. One of the fishermen has opened a small museum where you can see and handle his traditional clothing and his boat, and see his cormorants really close-up. For a small fee you can also try some ayu zosui – rice porridge containing some of the fish caught by the cormorants. Entry is free, and it’s open daily from 8:30am to 5pm, except for the second and fourth Sundays, and the first and third Mondays, of each month, and December 31 to January 4. For more details, see this website, or call directly on 058-232-2839.